Since when do eulogies get standing ovations, particularly from audiences that include everyone from heads of state to Oprah Winfrey? Since earlier this week, when Malawi President Joyce Banda--that country's first woman president and only the second woman to lead an African nation--paid tribute to her mentor Nelson Mandela at the final memorial service in his home village of Qunu. I have to admit that on reading the prepared text--something you'd expect a head of state to have at such an important event--I couldn't see what yielded the applause and ovation mentioned in the news coverage. For that, you had to watch or listen to the speech, because it's the moments when Banda diverges from the page that make this speech memorable. You can see her emotion most clearly when she's off-script, and it's no mistake that these are the moments that moved her audience, again and again. After three years of isolation, humiliation and name calling, I found myself in a situation where I had to work with those who had desired to prevent me from becoming President of my country. I had to forgive, but I had to forgive them without any effort, because my Madiba had prepared me. Tata’s courage, determination, love and passion for his people inspired me on my journey to becoming the first elected woman President in my country. I learned that leadership is about falling in love with the people and the people falling in love with you. It is about serving the people with selflessness, with sacrifice and with the need to put the common good ahead of personal interests. Another riff that delighted the crowd involved her sharing that reporters had been asking, since Mandela's death, whether she was carrying his lessons forward in Malawi. They asked, "'Are you practicing it? Are you doing it?' And I said, yes, come and see." What can you learn from this famous speech? Put yourself into it: Hands down, the best lines here are those that see the speaker being herself. Your personal perspective, those moments only you or a few people know about, can be the most powerful memories shared at a funeral. Banda's most personal story, about meeting Mandela, appears nowhere in the text--but it's a not-to-be-missed moment in the speech. Remember the ladies: Banda's position as a rare female president in Africa gives her the chance to feature women, which she does in routine references to "women and men," a subtlety that gender-flips a familiar phrase, and in her tributes to Mandela's former wife and widow. Women speakers have the chance to correct a long history of ignoring women in speeches, and Banda does us proud. Know and reflect your audience: When she goes off-script, sometimes it takes just a couple of words to turn a pro forma line into a crowd-pleaser, as when she changes "He championed the freedom of not only South Africans but also all Africans" to "all of us Africans," a line that drew applause. Banda has a good innate sense of how to rally the people, and when she uses it, it never fails. 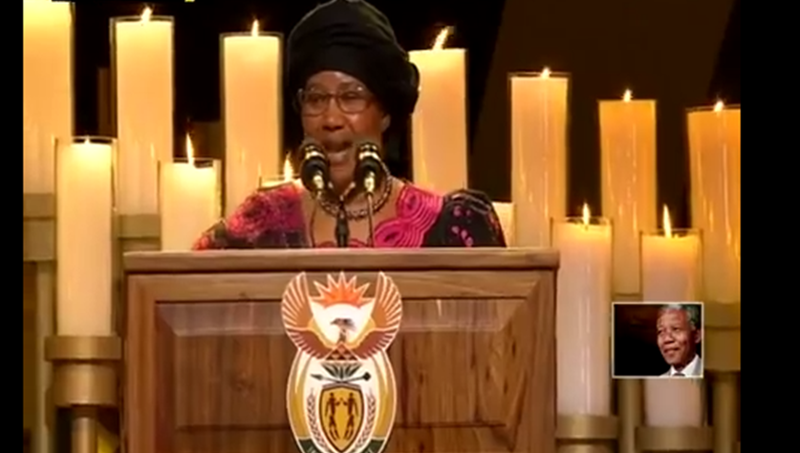 Use the platform: Her final and longest riff addressed the South African president directly, first praising him, then urging him on a serious matter much debated during the days of tribute to Mandela: whether South Africa would continue to be what she deftly termed "a rainbow nation." On a day that might have been left to fond memories, Banda did what smart presidents do: She put the agenda on the agenda, leaving it at the end for emphasis and using her opportunity to speak as a way to set a policy vision as well as a tribute. You can read the prepared text of her speech here, but be sure to watch the video below for the unscripted parts and the audience reaction. What do you think of this famous speech?